When Leigh Van Der Horst lost her beloved mother to cancer in 2008, she faced her biggest battle yet. 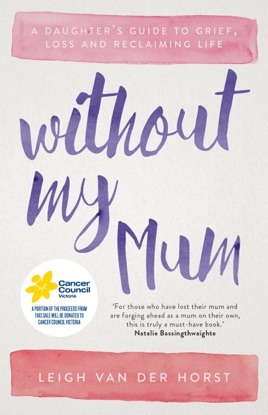 In Without My Mum, she invites us on a journey that is at times heartbreaking, others heartwarming, but ultimately comforting and inspiring. With warmth and candour, Leigh tells of her transformative passage through devastating grief, one that allowed her to rediscover and redefine her own identity. As well as exploring her own experience, Van Der Horst brings together stories from many inspiring women around the world, including contributions from Jools Oliver, Lisa Wilkinson, Megan Gale, Amanda de Cadenet and Natalie Bassingthwaighte. Leigh Van Der Horst is the mother of four boys. They live on Victoria's beautiful Mornington Peninsula. Leigh discovered a passion for writing when her beloved mother passed away from cancer and now regularly writes for her inspiring website 'Leigh V Loves'.